Maja Jantar is a multilingual and polysonic voice / artist, and director living in Ghent, Belgium, whose work spans the fields of performance, music, poetry and visual arts. From 2001 to present, Jantar has directed over ten operas, including Monteverdi’s classic Incoronatione di Poppea; Sciarrino’s contemporary Infinito Nero as well as Humperdinck’s Hänsel und Gretel and Bernsteins West Side Story, and created various theatrical music performances, for small and big stage, among others 4 performances for symphony orchestra directed at a young audience, with the Symphony Orchestra of Flanders. 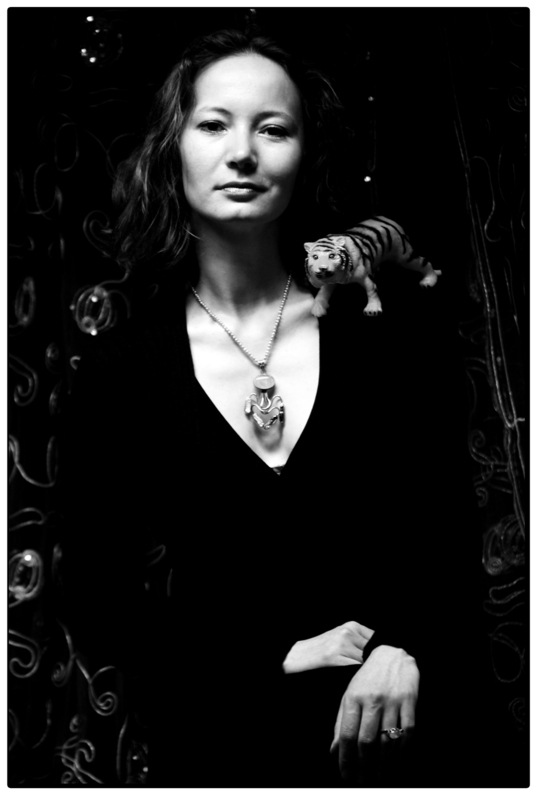 A co-founder of the poetic group Krikri (www.krikri.be), she has been giving individual and collaborative performances throughout Europe and experimenting with poetic sound works since 1996. Amongst her collaborators you will find artists from various disciplines, poetry, music, fine arts, theatre. Long time collaborators are poets Angela Rawlings, Vincent Tholomé, Steven J. Fowler, director Ewout D’Hoore, pianist and organiser Guy Vandromme and visual artist Hallveig Ágústsdóttir. Her visual poetry has appeared in various publications, amongst others the catalogue Zieteratuur (The Netherlands), and her visual work has been shown in several exhibits, recently at the Art Book Fair, at arts centre Wiels in Brussels, SecondRoom in Ghent, at Été 78 in Brussels and Les Abattoirs de Bomel in Namur. She is curently working on a solo release of her album reAd. There are also plans to make public some of her LUNALIA collaborations, amongst others with Xavier Dubois. Plans for a collaborative book release with Vincent Tholomé are planned for the summer of 2019. An her work will be featured in EOROPOE, an anthology of European poets. Recently she created the ceramic / sound installation aRmour a study in MUR for the Brussels Poetry Fest , and presented new work in Copenhagen, for ‘Fermenting Feminism’ at the Medical Museum. In the springtime 2019 the collaboration, with Festival of Flanders Mechelen, on Moon related concepts continues and she will direct the opening concert, and perform fairy tales. Her work will be represented in LA VOIX LIBERÉE a sound poetry exhibition at Palais de Tokyo in Paris. She will partake in the European Poetry Festival organized by Steven Fowler in London and Paris, and collaborate with composer Esther Venrooy on a new opera: ‘Un soupir, un silence, un mot’ for Ragen, Maastricht ( The Netherlands). 1995-2000 : Art Sciences, specialisation visual arts at the University of Ghent (BE), thesis: Le poison de l’être – a search for Antonin Artauds Rodez drawings. 2001 : Action Painting studies with Herman Nitsch at the summer academy in Salzburg. and a Guest professor (opera direction, and extended vocal techniques) at the Royal Conservatory of Brussels. 2016: ‘“That Other Stoic Comedian“: des oeuvres, des performances et des lectures autour de l’écrivain irlandais Flann O’Brien.’, Été 78, Brussels, Belgium. 2011/2012: Als de klok dúmdi rumdi dú tikt’ piece based on Wohltemperierte Klavier by JS Bach, première at Concertgebouw Brugge followed by belgian tour. Directing and creating Als je slaapt… an opera for children from 3 to 99 for the Flemish Operahouse in Gent and Antwerp. Directing and playing Kaba, a duo music theatre piece voice – violin, based on the musical theme of the Kaba as a melancholy story. 2014: Directed Hans og Greta (Hänsel und Gretel by Humperdinck in Icelandic translation) for the Öp-Hópurinn group in Iceland, a rerun is planned for may 2015. Directed ‘Ontdek me, Alies’ for the Symphonic Orchestra Flanders, played in december at De Singel, Antwerpen, and Concertgebouw Brugge. Directed a new show ‘Lass mich los’ based only on works by female composers, with Chia Fen Wu, Dirk Moelants, Sabrina Avantario, avant – première at Kleurenfabriek festival, Drongen. Revival of Gezi park at Bozar arts centrum in Brussels. Creation of Kirkjubaejarklaustur voice performance based on a book by Vincent Tholomé, together with Vincent Tholomé and Sebastien Dicenaire at Centre Pompidou, Paris, France for the Bruits de Bouche festival. Video performance in combination with renaissance music, organised by OneOff in Scherpenheuvel. Duo performance La conquète du pays Ugogo with Vincent Tholomé at Festival Général Instin in Paris. Performance on Lou-Andreas Salomé at the Rich mix in London, for Kakania, organised by Steven J. Fowler . 2015: Workshops writing and voice for Creatief Schrijven. Performed ‘Koningskind’ a production by Alexandra Aerts in various culture centres in Belgium. Performance of ‘The Waves Wash over the Signal of the Incoming Train’ with pianist Nathalie Alessi, at the Bogliasco Foundation, Liguria, Italy. Performing at Général Instin with Vincent Tholomé and Angela Rawlings . Directing West Side Story for OdeGand, Festival of Flanders Ghent. Group exhibition at the Wiels Art Book Fair – Brussels Poetry Festival. Tour in the US with ‘Waves wash over the signal of the incoming train’ with Nathalie Alessi. Performing with Steven Fowler for the Hub, in London. Working with the singing class of the Royal Conservatory in Brussels, creating an opera together. Première ‘Ali Baba’ in Concertgebouw Brugge and De Singel in Antwerp with Symfonie Orkest Vlaanderen. Concert at Beursschouwburg in Brussels and De Player in Rotterdam, music by Ben Vida, organised by Kraak. Workshops voice and performance for Creatief Schrijven. Residency at Abatoirs de Bomel in Namur, with Vincent Tholomé. Performance at Parasol Unit, London. Sibyllaria at the Festival of Flanders Kortrijk. Performance with Tomomi Adachi at Spektrum in Berlin. Performance at the Österreichisches Kulturforum ‘Kakania’ in Berlin. Creation of ‘Grindig’ by Pé Okx and solo performance for the Landscape opera ‘De grensmaas vertelt’ in Maastricht. Exhibition of artwork at SecondRoom in Gent. Performance The the Wellcome Gallery for the exhibition ‘The Sound of Consciousness’. Dadaistic poetry box workshop for The Brussels Poerty Festival. Performance in Barcelona for Vocal Vertebrae. Performance in Frankfurt, for the Buch Messe, at the Haus am Dom. Singing ‘Kafka Fragmente’, by György Kurtág, with violinist Vladislav Pesin, in Moscow State Philharmonic, Chamber Hall, for the V International Actual Music Festival “Another Space”. Residency with Vincent Tholomé at Abatoirs de Bomel in Namur. Various performances with Vincent Tholomé based on new work created at the residency. Performance with Phil Maggi and Xavier Dubois an the Labelnight of SubRosa records, Brussels, Belgium. Performance with Soplarte on the glass instruments for Musikfestspiele Potsdam, Sans Souci, Germany. Performance with Song of [Y] at the fermenting feminism gatehring – in the Medical Museum, Copenhagen. Performance with Vincent Tholomé for [E]critures Hybrides in Charleroi and Brussels. 2) a more fluid conversation via messenger or email. Your choice. Hi, Yes we can do that, let’s try the more fluid version – via e-mail. Would you like an e-mail update for new posts?